Last weekend the sun dragged the three of us down to Cardiff Bay. Since we first moved to South Wales over 20 years ago this once neglected corner of Cardiff has gone through a transformation. Then the bay was open to the huge tidal range at occurs in the Severn Estuary, leaving large expanses of mud flats when the tide was out, although not pretty to look at is was a place where wading birds gathered in large numbers. The loss of a large winter feeding area for migrating birds led to the development of the Newport Wetlands further east into a large nature reserve. Controversially it was decided to build a barrage across the bay, creating a large freshwater lake. 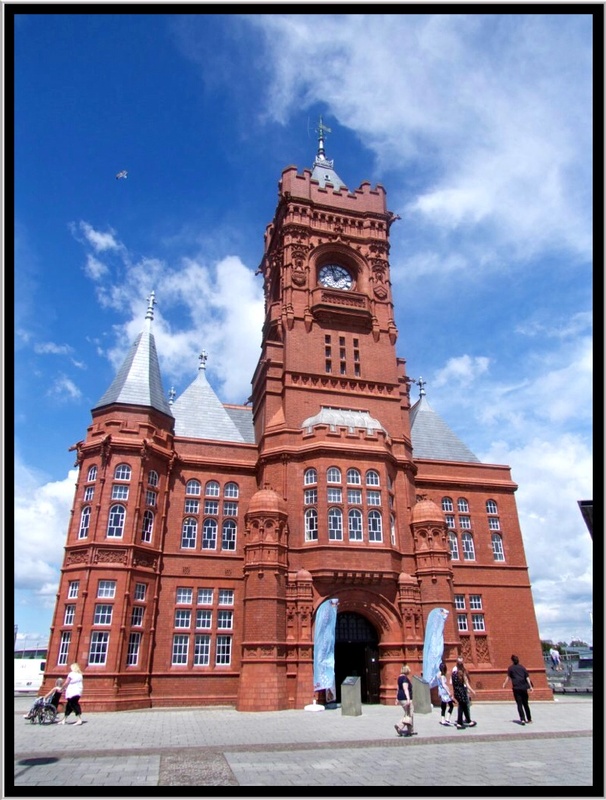 This was accompanied with investments from business building major office complexes, government spending on new theatres, the Welsh Assembly, cultural landmarks and the development of the old docks with private flats. 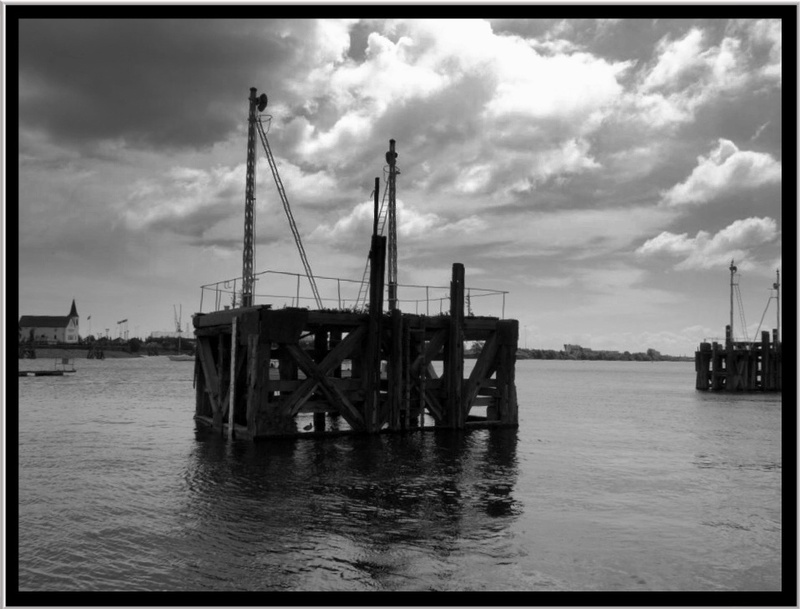 The old dock piers are still great features and reminders of the old docks. The transformation has been impressive, and also includes a vibrant restaurant quarter where you can choose from traditional pubs, Italian, Persian, Chinese and an American Dinner. 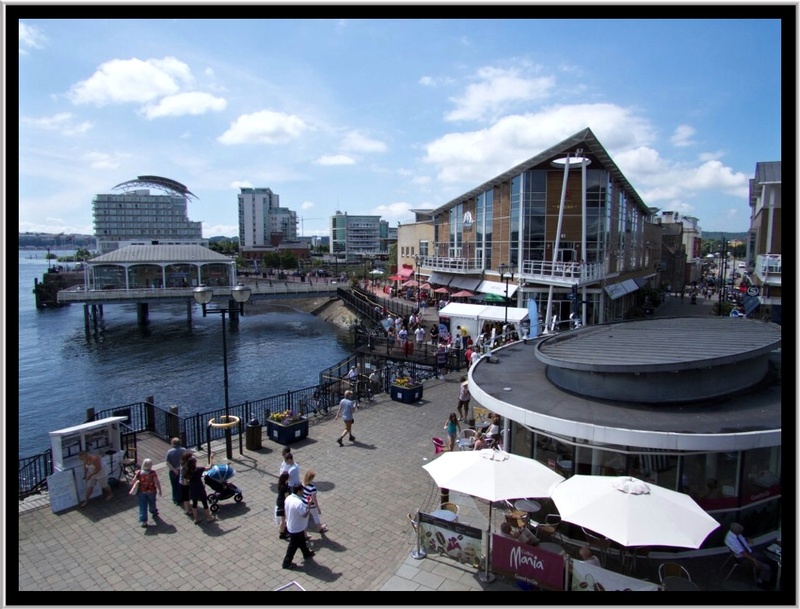 It is now possible to walk all the way around the Bay, and Aunty and I have done this in the past, but with Number One Daughter included today we took the easy route over to the Penarth Marina, and took the water bus back to the Waterfront. Along the paths butterflies patrolled and fought to be the first to breed with any passing females. 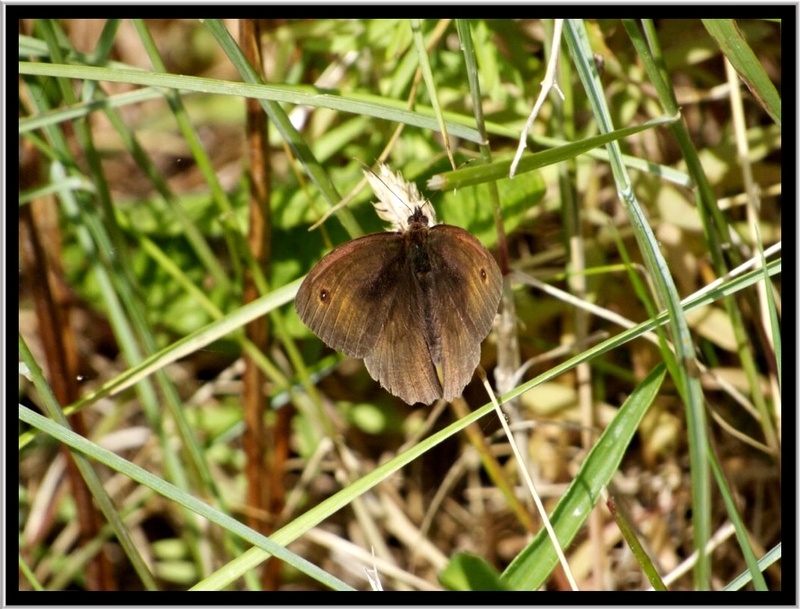 Meadow Brown resting and waiting for his next chance. 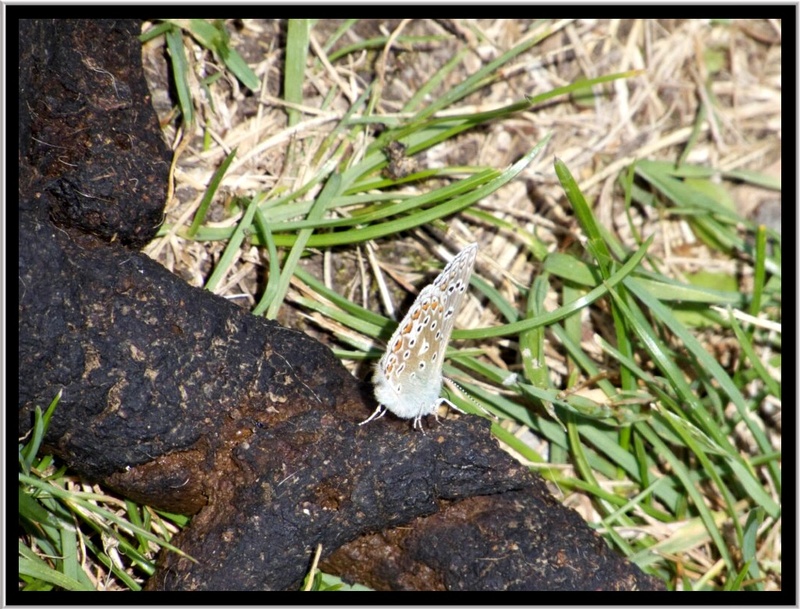 Although not the most glamorous of places to pose for a photograph this common blue was obviously finding something interesting on this dog poo. However, an aside to this is my frustration of dog owners who seem to be happy to leave evidence of their passing along footpaths. Apart from the sight and smell, there’s the parasite infection risk to kids playing the area. However, this small piece of disagreeable evidence of lazy selfish behaviour was countered by the planting of annual plants along sections of the path creating riots of colours as the sunlight hit the flowers. 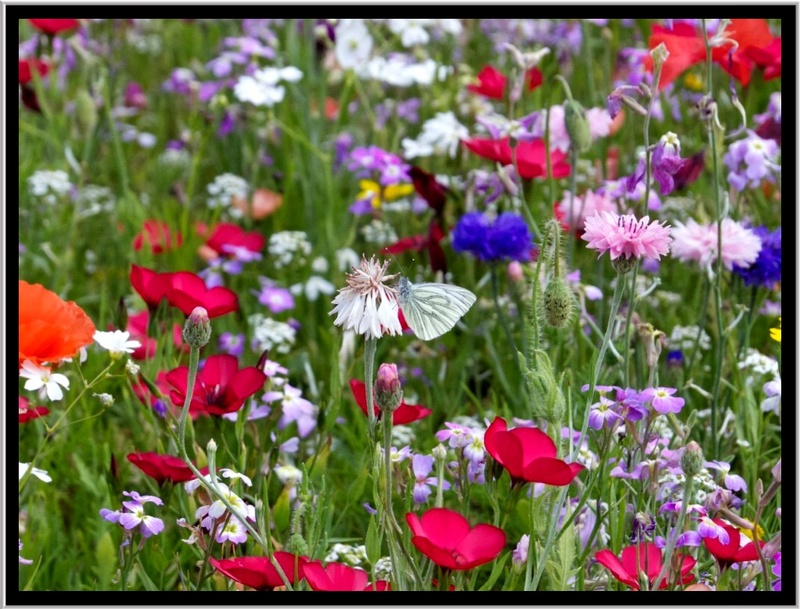 Some areas where a riot of colour. 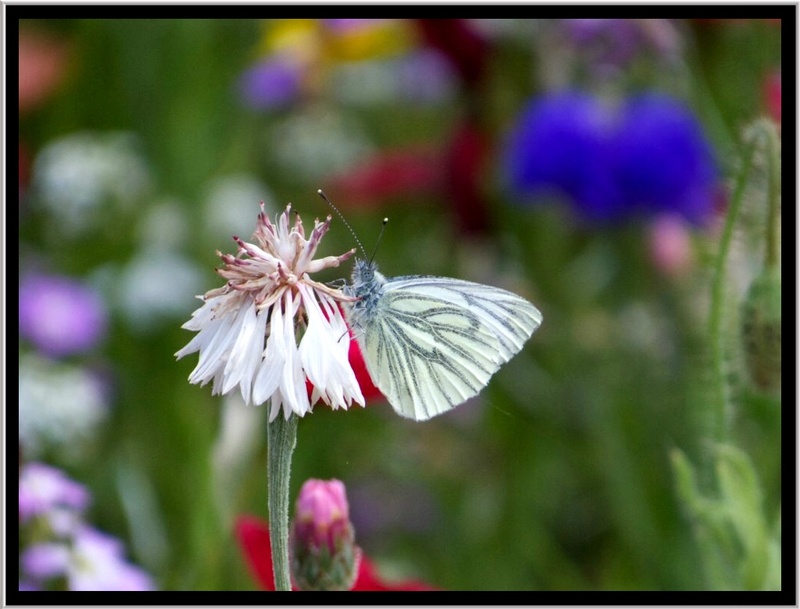 A Green Veined White butterfly feeding. 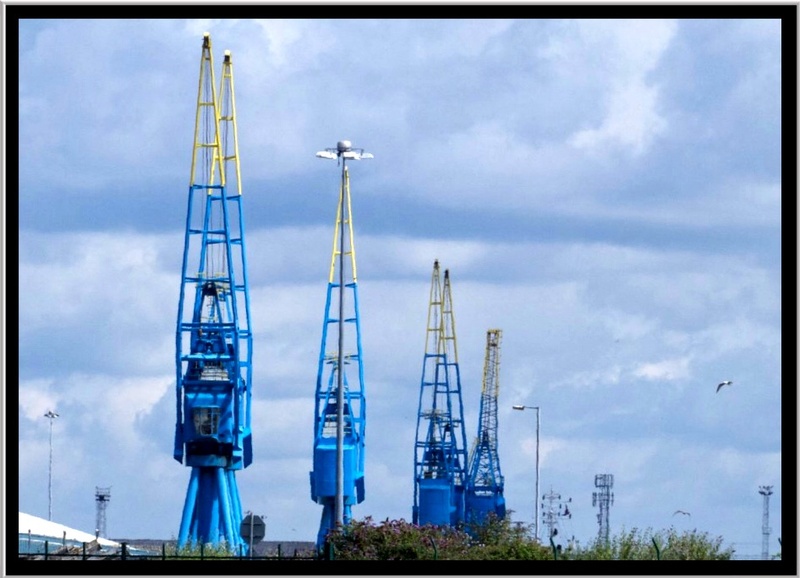 There is still part of the port complex still working, and the line of large cargo cranes remain visible on the sky line. The large freshwater lake is now a Mecca for yachting and boating. Aunty and I keep on thinking one day we will get our act together and join the yacht club to learn to sail one of the little sail boats. One day! 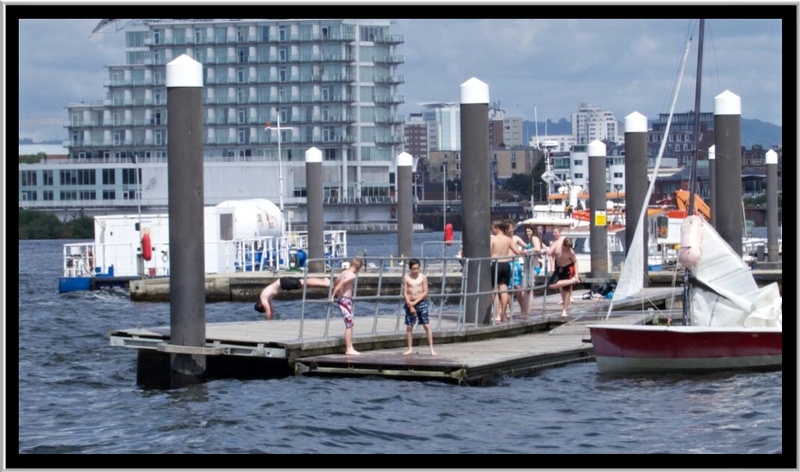 The kids were having a great time jumping off the pontoons. 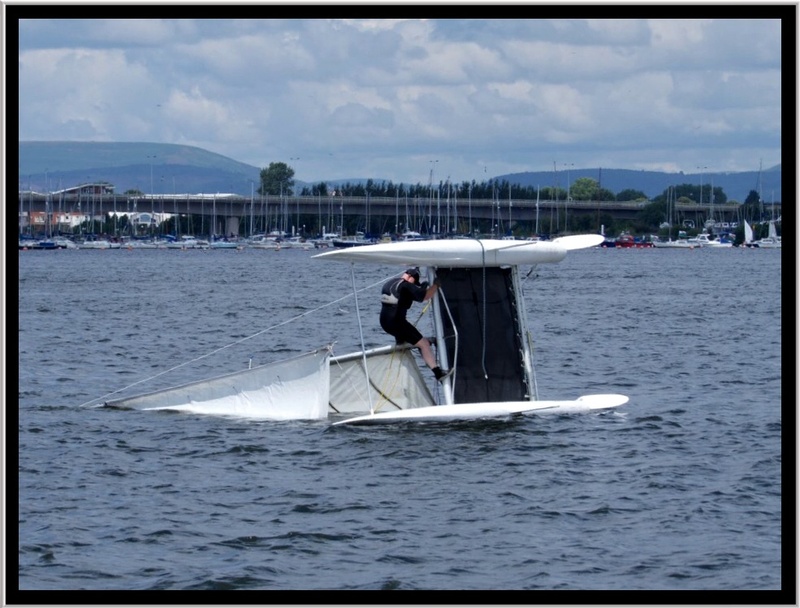 I imagine if we ever do have a go we’d spend most of our time in the water like the chap below who was struggling to get his boat upright again. May not one of his best days. The barrage separating the estuary for the bay is pretty impressive up close. 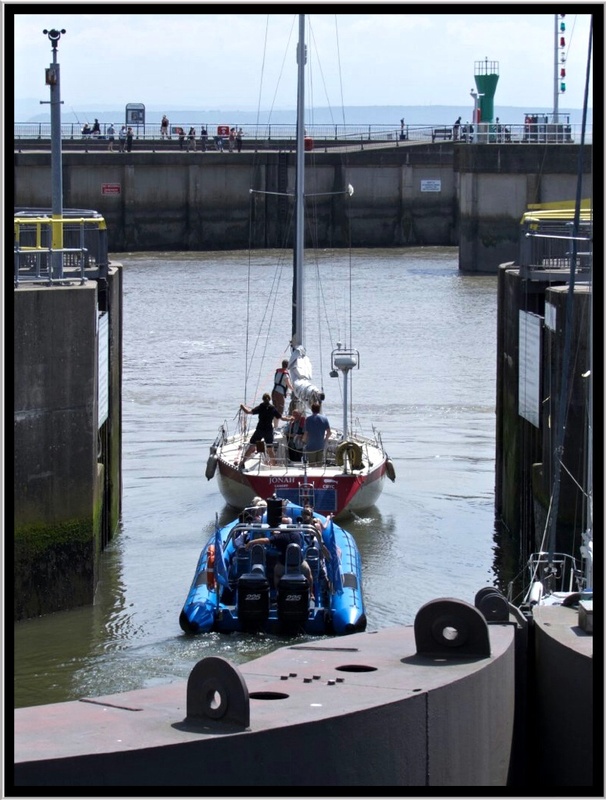 There are three locks built into the barrage itself that allows the boats to come and go. 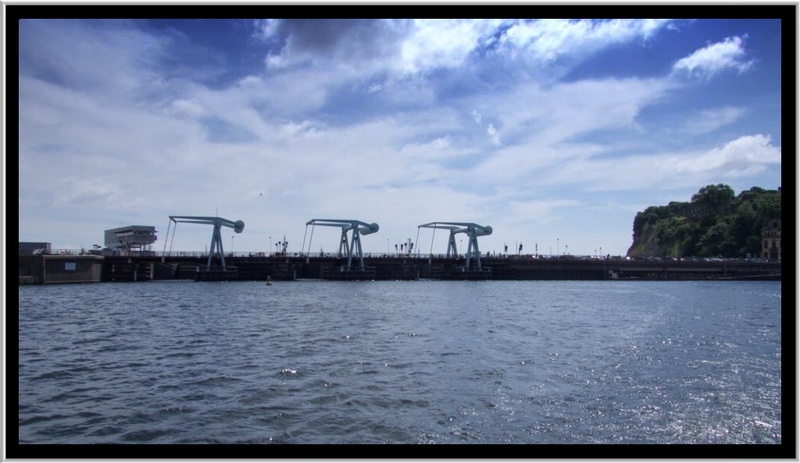 The barrage from the water showing the lock gates and cranes that lift the road way to allow boats in and out. The view from the barrage across the Severn Estuary towards Flat. 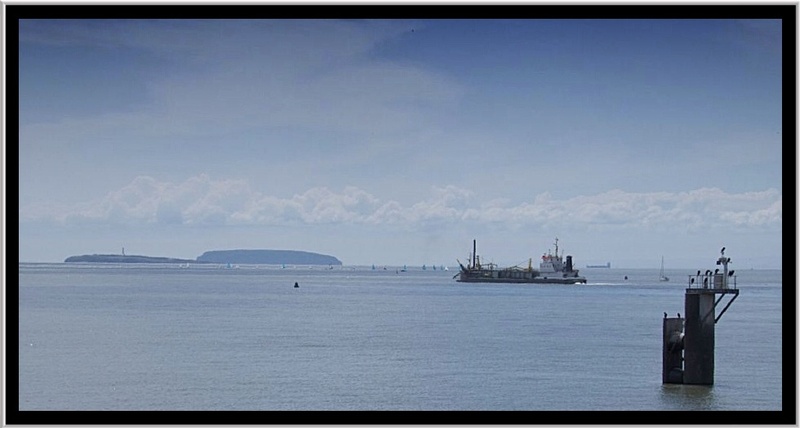 Holm and Steep Holm. I’ll let you work out which one is which. But there are no prizes for getting it right. It is possible to walk over the barrage right around to the Penarth Marina on the other side of the Bay. The old customs house has been converted into a smart restaurant. However, a large part of the complex is still derelict, and all the plans for conversion to date have been denied by the council. 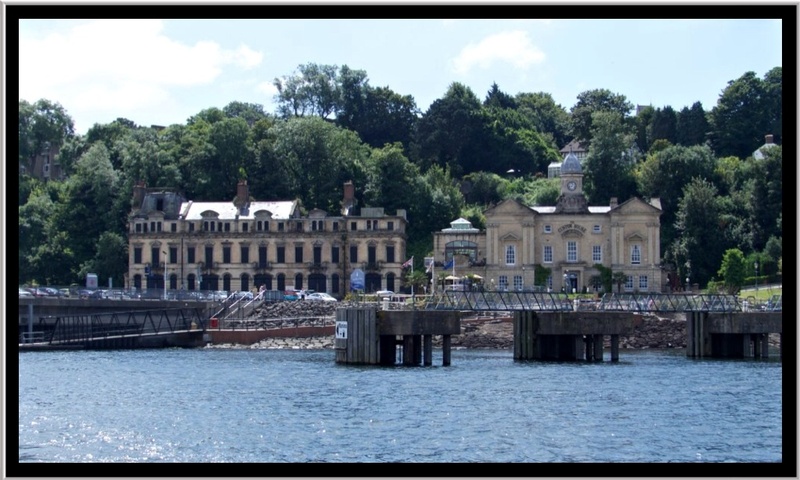 Looking back towards the customs house at Penarth Marina. By this time we decided to take the boat taxi back for lunch. Back in the Bay Area the Pier Head building dominates the water front. This was part of the Administrative area of the old docks when coal was king, and the port was filled with hundreds of ships exporting Welsh coal around the world.the brick red brick building contrasts with everything surrounding it. The clock is known locally as the Welsh Big Ben. It is now used as an exhibition hall. The Millenium Concert Hall peeking out from behind the Pier. Head Building. The Millenium Concert Hall had a rather turbulent inception, with the first set of designs being accepted and then rejected, but eventually is was built, and now stands proud. 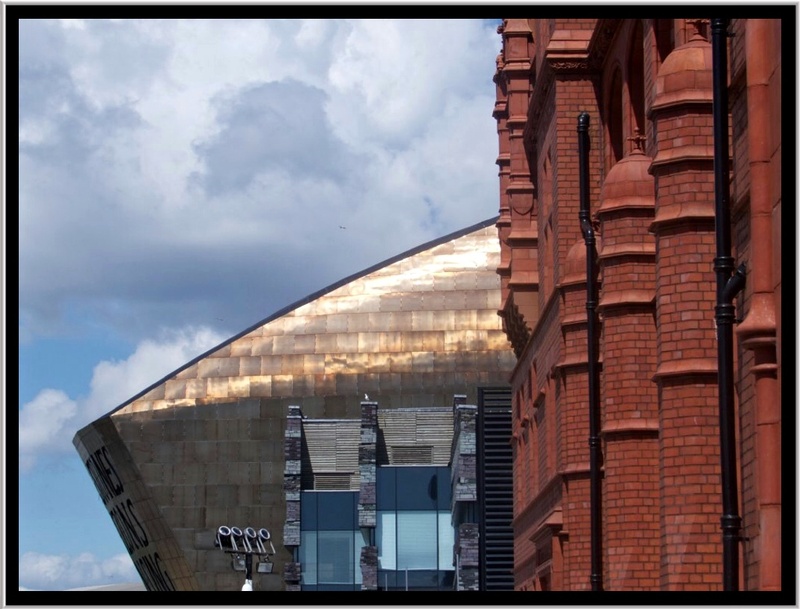 The design picks out the industrial and natural heritage of Wales incorporating ‘slate cliff’ walls, and a beautiful copper roof that gleams in the sunlight. Inscribed on the front of the dome, above the main entrance, are two poetic lines, written by Welsh poet Gwyneth Lewis. 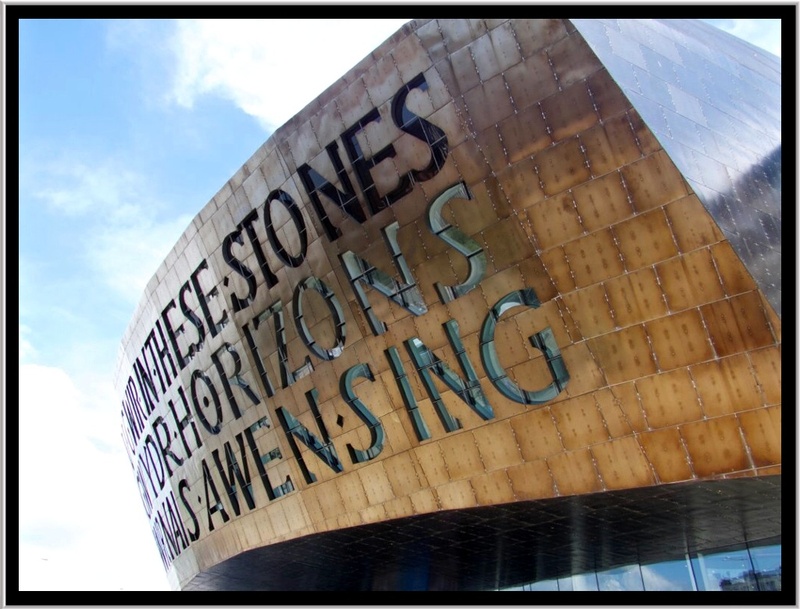 The Welsh version is Creu Gwir fel gwydr o ffwrnais awen, which means “Creating truth like glass from the furnace of inspiration.” The English is In These Stones Horizons Sing. After all this culture and walking it was time for lunch, and while the girls sipped cocktails on the veranda I was stuck with a diet coke, having lost the arm wrestle for who would drive home.